Opinion: By Todd Franko | April 8, 2018 at 12:00a.m. One of the more popular recent items The Vindicator has ever sold (outside of the daily newspaper) is a drawing of Jim Tressel in a boat crossing the Mahoning River. It was the creation of our art director, Robert McFerren, at a time when Tressel was being courted for the presidency position at Youngstown State University. The drawing is clever. It is a takeoff of the famous image of George Washington crossing the Delaware River – leading his troops to glory. 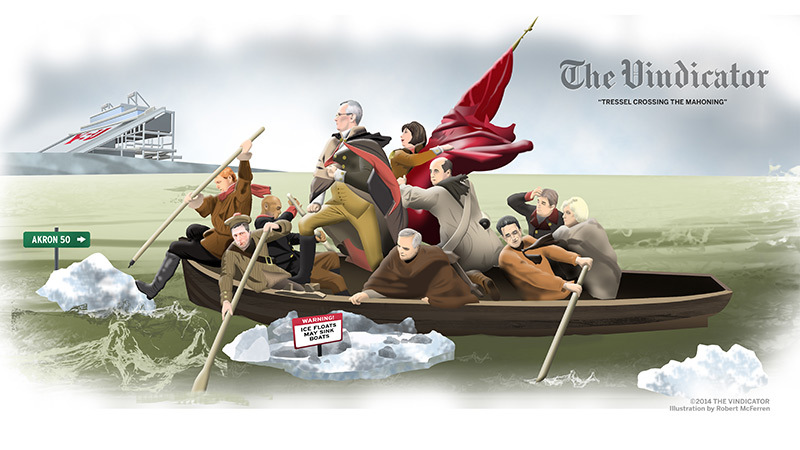 In McFerren’s work, Washington is replaced by Tressel, and the boat is loaded with local leaders as they paddle the boat across the Mahoning. The paddlers are the who’s who of local leaders who all signed a petition of sorts endorsing (well, imploring) Tressel as president of YSU. The petition was authored by U.S. Rep. Tim Ryan of Howland, and the signers we’ve affectionately dubbed the Gang of 32. It’s been a few years since that momentous period, and ... it’s turned out pretty well, eh? Most would say it’s been better than pretty good. It’s a fairly outstanding time at YSU despite initial concern a tremendous leader in one arena does not easily transfer to a leader in academia. I offer that now because here is Youngstown, again, with a chance to contribute to a dynamic change. Joe Schiavoni is a Democratic candidate for Ohio governor. If the homegrown product is to advance past the primary and through the general election, he needs his own Gang of 32. I’m a fan of Schiavoni personally, and am continuing to understand him more as a gubernatorial candidate. But he certainly fits my desire to buck the norm when appropriate, same as Tressel’s presidency did. Schiavoni’s been running for governor officially for about two years; unofficially longer. We’re a country that likes bootstrap heroes. We celebrate the underdog and the upstart. Politics loves your father’s Oldsmobile. Schiavoni, of Boardman, said it, in a way. So did Richard Cordray, a Democrat also running for governor. The two candidates appeared at The Vindicator last week. Four other candidates will appear in the next two weeks leading up to the May 8 primary showdown – Democrats Dennis Kucinich and Bill O’Neill and Republicans Mike DeWine and Mary Taylor. By Cordray’s own admission, one of his leading qualifications for him in the primary: He’s the only one who can get elected on a statewide ballot. He reminded us he lost the 2010 attorney general race to DeWine by just one point in a tough year for Democrats. Schiavoni said he gets great feedback and support when he meets face-to-face with people around Ohio. But when he gets in front of county party leaders around the state, his support gets nuanced. He’s liked, but “it’s not the right time,” he’s told. “It’s the most frustrating thing about this,” Schiavoni said, his head shaking in disbelief and his voice trailing off. As with his opponents, his plans, too, pass the test. His personal background is not tabloid fodder. Heck, some GOP legislation on guns, charter schools, water quality and broadband expansion are his initiatives rolled over to the power side of the aisle. Despite this reality, he can’t gain acceptable status from county party bosses besides those in the Mahoning Valley. Kucinich, out of office for six years, has a political career that feels like it started before Oldsmobiles. Yet there he is, a front-runner tied with Cordray in a key poll last week. Of that poll, Schiavoni is quick to point out 49 percent of Democrats are undecided. That, he says, shows more about his opponents and his chances than his current 16-point deficit. Could a Gang of 32-type move help Schiavoni? Actor and Youngstowner Ed O’Neill is willing to be one member. A 30-second commercial of O’Neill supporting Schiavoni is getting finished. We saw a rough cut Friday. Politics is a fickle arena. The best candidate “who can possibly get elected” or “who can raise the most money” gets preference over the “best candidate, period.” But the party and the process can be jolted. That was so in 2016 with Donald Trump and even with Bernie Sanders for a bit. That was the 2008 election with Barack Obama. We’ve seen the election system recently get flipped in Alabama and Pittsburgh. It is possible at Schiavoni’s level, too. The May primary is as much a chance for the Valley as it is for Schiavoni himself. Local leaders and citizens sit back and bemoan the prominence of Cleveland, Columbus and Cincinnati in state politics and policies, and what that costs places such as Youngstown, Warren, Steubenville and the like. Changing that tide means changing those faces. Those chances don’t come often. This is one. If locals feel Schiavoni has served them well, it will be locals who push across Ohio to make this chance work. That it hasn’t happened enough to date is perhaps a measure of Schiavoni’s abilities. Or is it a measure that the Valley just hasn’t realized its opportunity as it did when it needed a new YSU president? The chance has four weeks left. Todd Franko is editor of The Vindicator. He likes emails about stories and the newspaper. Email him at tfranko@vindy.com. Tweet him, too, at @tfranko.